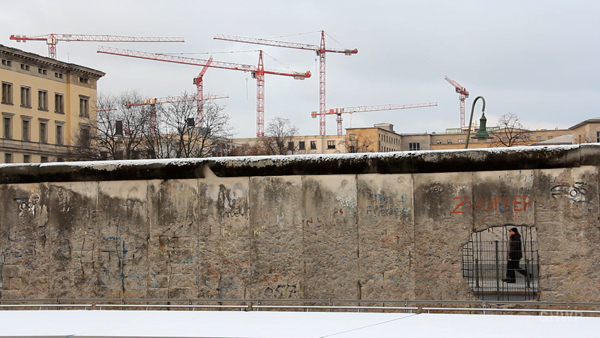 There are still quite a few pieced of The Wall (1961 – 1989) left in Berlin. Well known places are the East Side Gallery, the Memorial at Bernauer Strasse and the pieces at Potsdamer Platz (even though those were moved there from a another location). Despite the bitter cold I went out this past weekend to visit those and a few more. Also I kept an eye out for random pieces in courtyards and behind fences. But because it was so bitterly cold I didn’t get to all of them. The border at Bösebrücke was the first one to open on November 9, 1989. The graffiti in the last clip “Niemand hat die Absicht eine Mauer zu bauen!” (No one has the intention to build a wall!) is a quote from one of the most influential East German politicians Walter Ulbricht, who proclaimed this the same year the wall ended up being built. Something that I really appreciate about how Berlin memorialized the wall are the cobblestones laid out on streets and sidewalks where the wall used to be. Just like the Stolpersteine, that remind us of the people who were taken out of homes and businesses to disappear in concentration camps, this is a subtle, but effective and lasting way to remind us of the horrors of the past. If you’d like to find them all yourself, this page on the Berlin Mauer Online website is a great resource. The music I took from Soundtrack Pro.